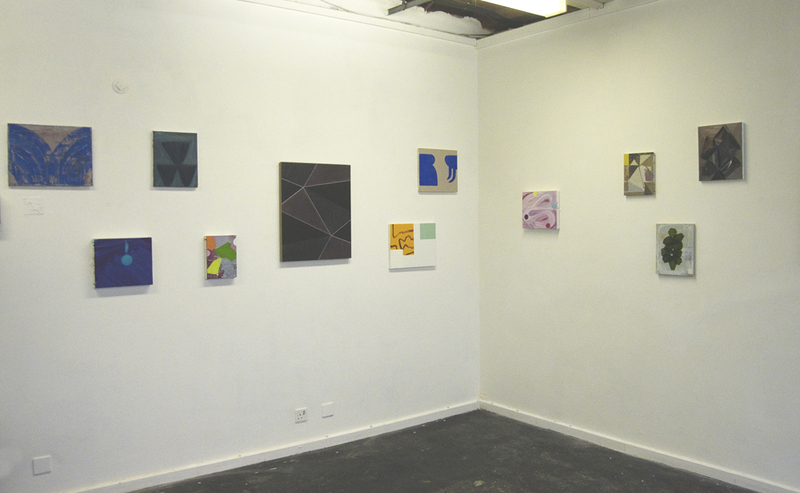 Summer Mix at Turps Banana Gallery is their first salon-style summer show. I am delighted to be included in such company. The artists are as follows. 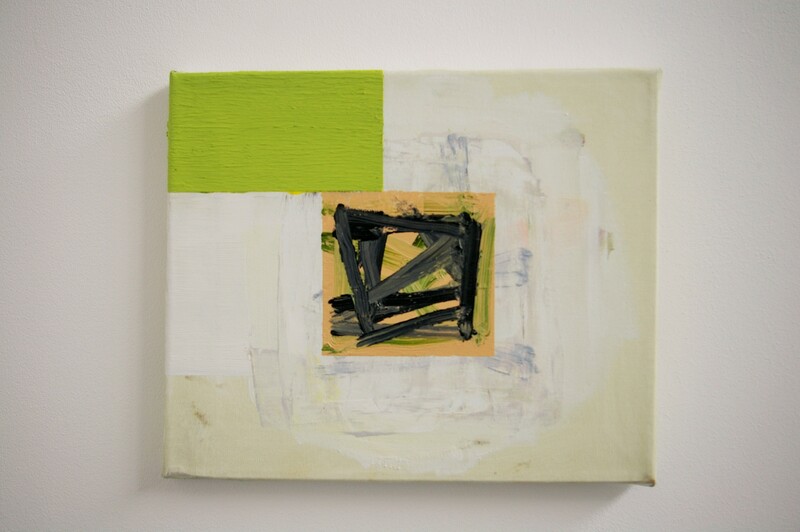 My own little painting comprises two 12″ x 12″ canvases, a duo, or perhaps even better, a double or twins, as one is identical to the other, in terms of the process used for dividing each square. One of the things that interests me when the two are presented side by side, almost adjoined, is that what was edge becomes centre. The yellow line that, as edge, was almost unnoticeable, as centre becomes quite prominent. 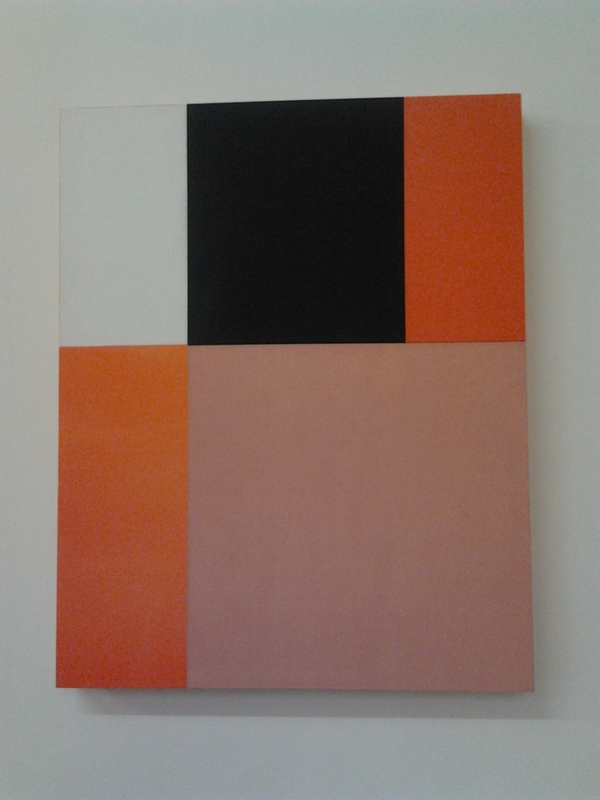 At the centre of the exhibition, and quite prominent, is a wonderful Richard Kirwan painting, Frame of Reference. 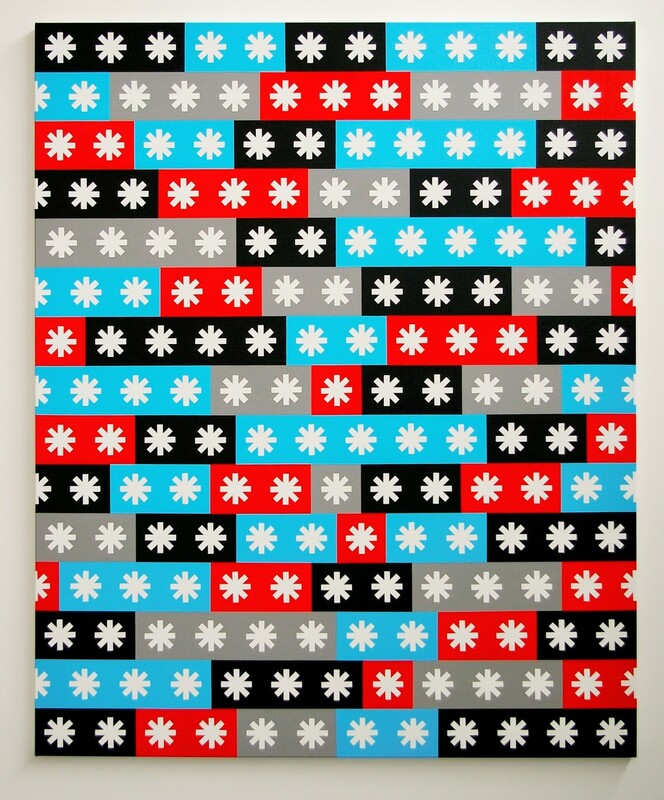 It is as disorienting as it is strident, with flat dayglow colours arranged in bands, supporting white stencilled asterisks that appear to rotate. There’s a strange spatial thing going on but with absolutely no attempt to depict a place where something happens. There’s no picture here, but some of the asterisk shapes are closer to me than others, which seem more to recede, especially when comparing a set of asterisks on a different band of the same colour. I am looking now on the fifth row down in the central black band and comparing the two asterisks there with the two on black in the row above, quite a deep space seems to open up between the two sets. And this keeps happening as I look at other parts of the painting too. So there’s the illusion of movement and the illusion of space yet no illusionary scene within which a narrative might develop. 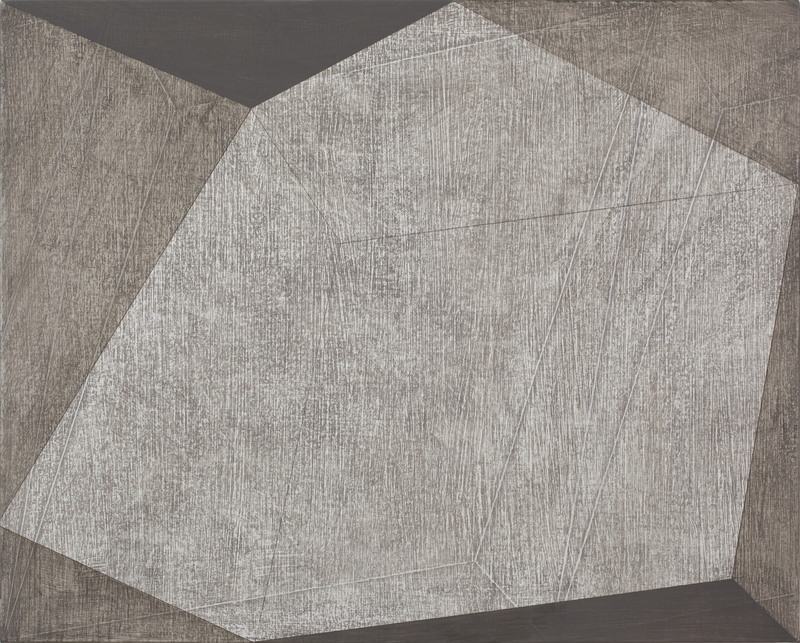 Richard Kirwan, Frame of Reference, 2012, acrylic on canvas, 168 x 137 cm. My photo. 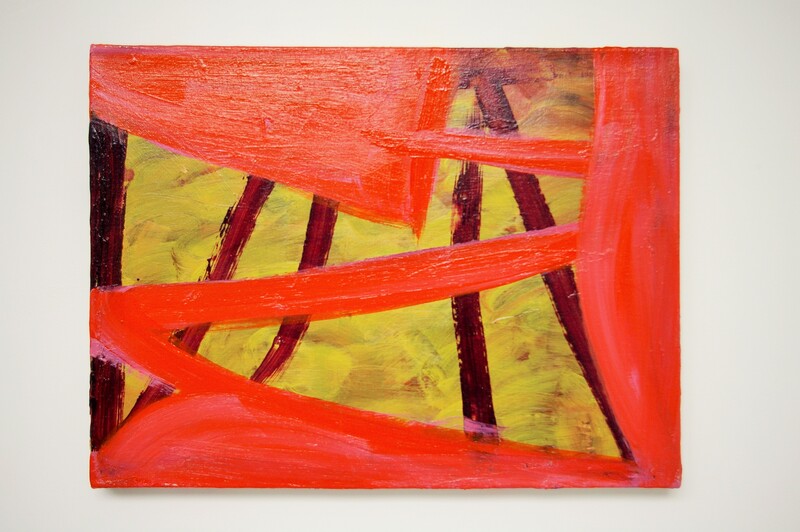 Mali Morris, Crossings (Red), 2014, acrylic on canvas 43 x 60 cm. My photo. 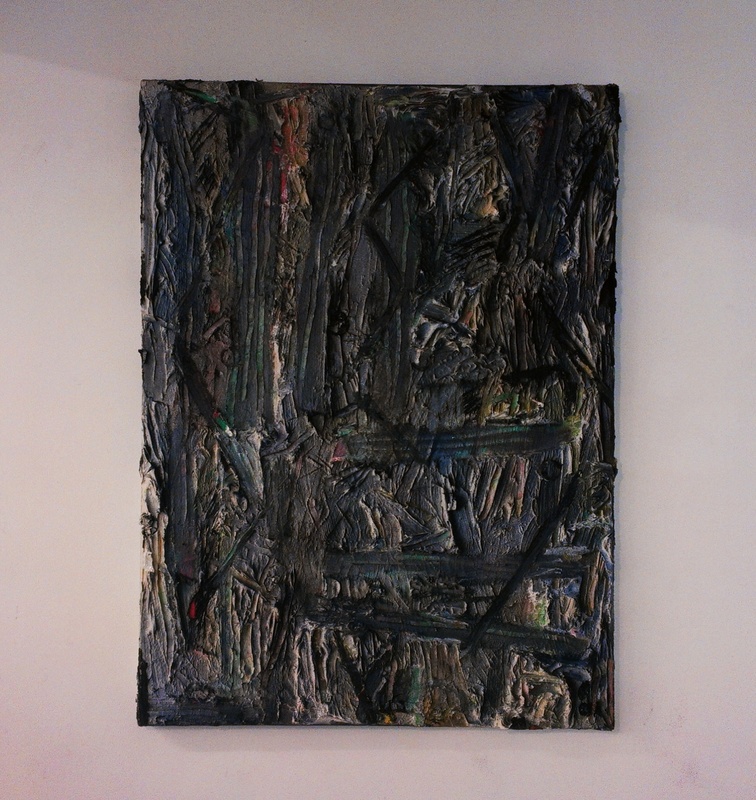 Whilst I think it unlikely that Morris is deliberately connecting to photography, there are other works here that may have a more direct link, such as Damian Taylor’s Untitled (in), which reproduces the inside of the metal support he uses to paint on, like a photocopy of the inside of a stretcher. 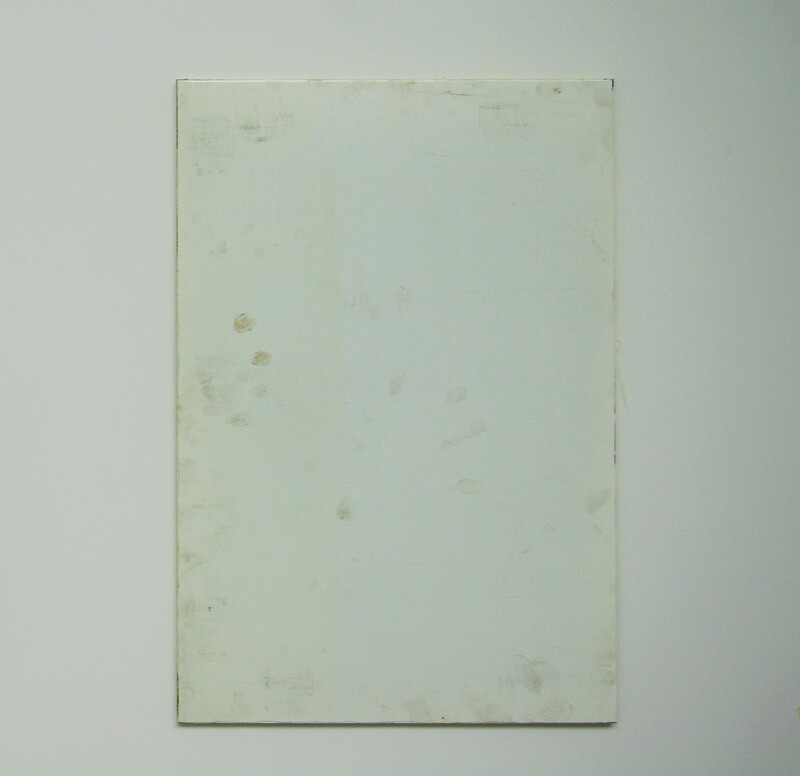 The work takes the form of a white monochrome, very nearly a picture of nothing, a representation of itself in its blank state. Based on information from Taylor’s website, (rather than from sensory evidence I must admit, even though I am looking directly at the work), I think it is a resin cast of the inside of a folded metal tray. I can see smudges and incidental hand prints or dirt marks, and not much else. Is it a painting, a sculpture or a print? And are all paintings all three of these anyway? What, to begin with, looked very slight now becomes complex, first intellectually and then, as a result, visually. I do think it is that way around in this work. Though either way it is a fascinating piece, and I am totally intrigued by it. 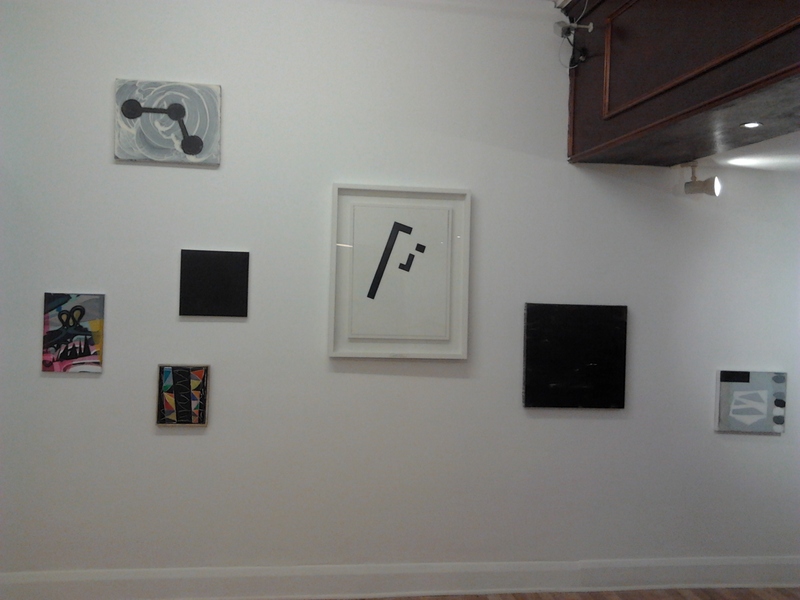 There are other monochromes here too: Louise Evans’ Untitled (Russet), and possibly Stuart Elliot’s Untitled, may be best thought of in this category, as may Rose Davey’s Untitled pair of paintings and Dan Roach’s meticulously painted Homebound, which is not a monochrome in the sense of a potentially imageless coloured surface, but rather in the sense that there is one colour, white, on an unprimed canvas support. Here, overlapping layers of natural hexagonal cells, reminiscent of a wasp nest, create a swirling circular movement that becomes a vortex, deepening spatially the more I view it. 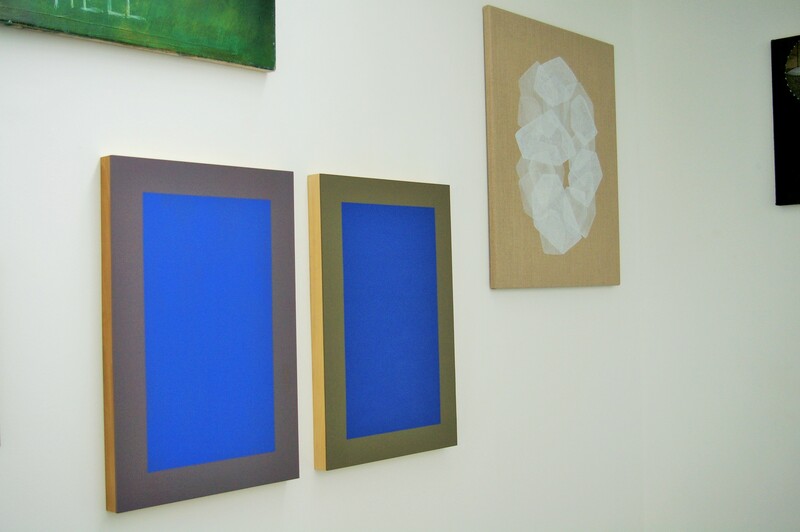 In Rose Davey’s double painting each panel presents a blue rectangle bounded by a brown band, as if the blue were mounted on the brown. 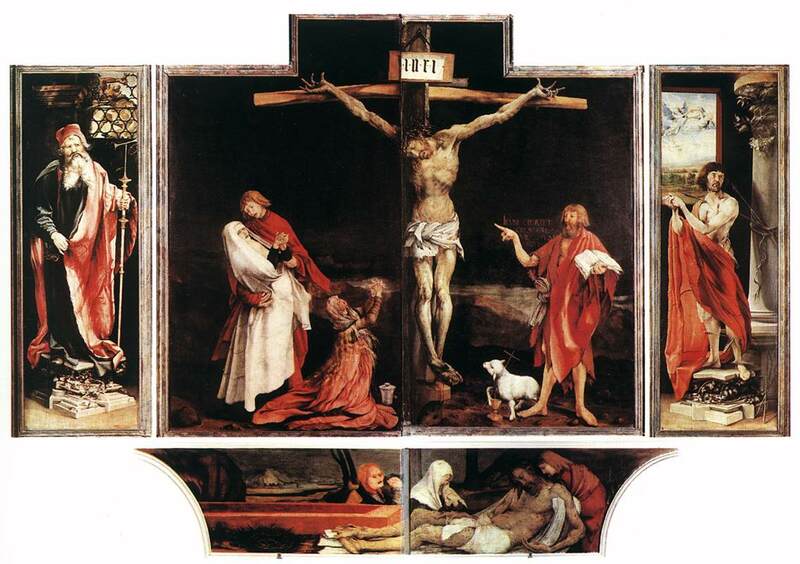 At first appearance the two panels are identical. However, like seeing twins and only gradually perceiving the differences, I start to notice that the two blues are not the same. It is actually Katrina Blannin who points out to me the possible changes in hue, yet it remains unclear to us whether it is simply that the frames are of different browns, one being nearer to yellow the other being nearer to violet, thereby creating different experiences of the “same” blue or whether in fact the two blues are physically different. My money is on the frames alone being different. 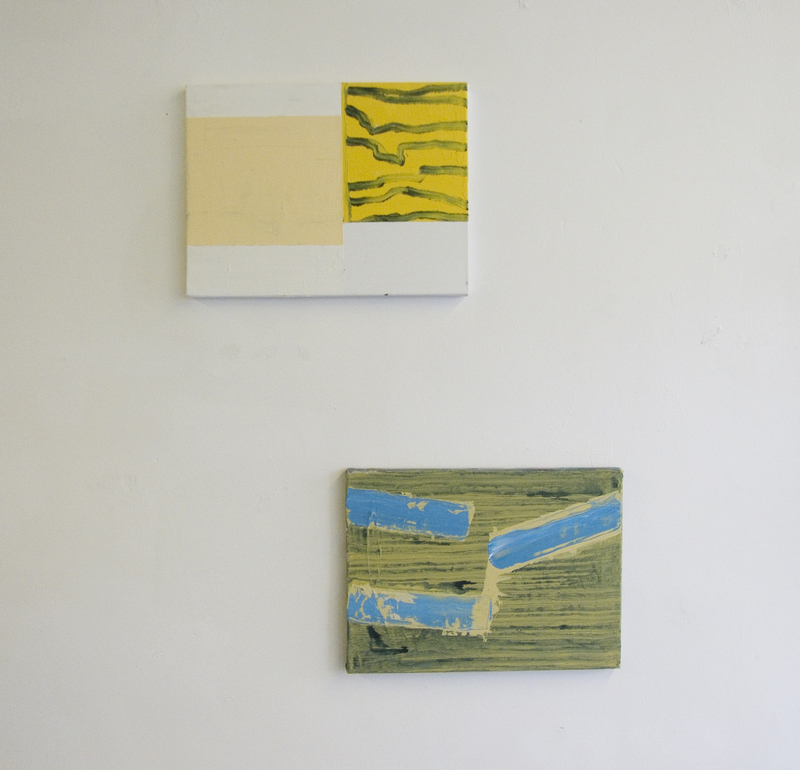 David Ryan’s Set 2 (c) also seems to have some doubling going on, this time within the one painting, in the repetition of rectangles that occupy different spaces, one in lime green, one in yellow ochre and one in white, as well as the containing rectangle of the support. The green appears to be an opaque “outer” whereas the ochre houses some internal happening or other, stage like in appearance, almost like a play within a play. There is contrast in the ways in which different parts are painted: scumbled brushstrokes or gestural rhythms differentiating themselves from areas of flat matt colour. The more clearly delineated rectangles cluster towards the top left quadrant of the painting, almost in conflict with the unformed-ness of the rest of the canvas, “we three against the world”. 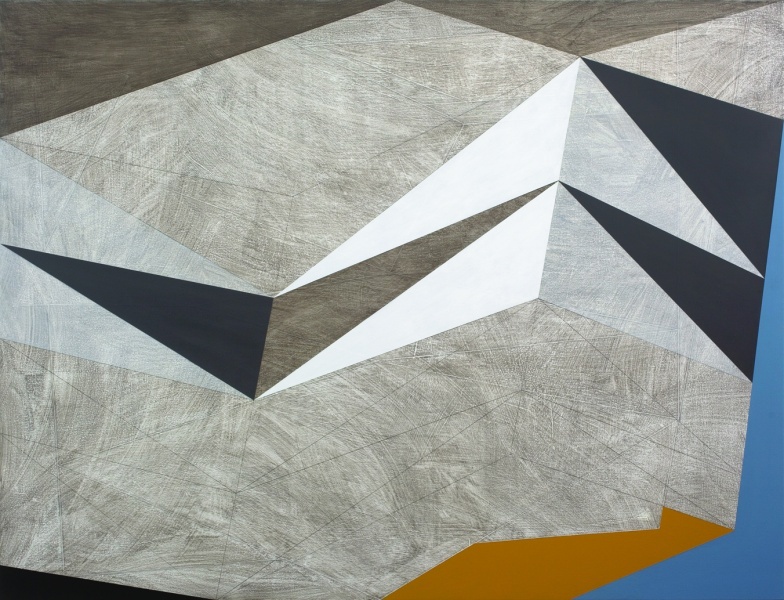 James Fisher’s painting may look abstract, with geometric shapes in a non literal pictorial space. However, it contains clear representational elements, a fan, or a stairway, along with architectural cubes, suggestive of a fortress or castle ramparts alongside the natural geometry of plants, or animals, sponges perhaps and what could resemble a sea creature, at first I am thinking coral, then even a brain a heart or some other internal organ. There is imagery, and possibly some narrative that is hinted at, evoked, but only ambiguously described, rather like in a dream, or a song or a poem. The work is named after the traditional Irish folk song Eileen Aroon. Could it be that a painting may evoke in a similar way to a song, and yet also be less fleeting, more fixed, possibly maintaining a beauty that does not fade? 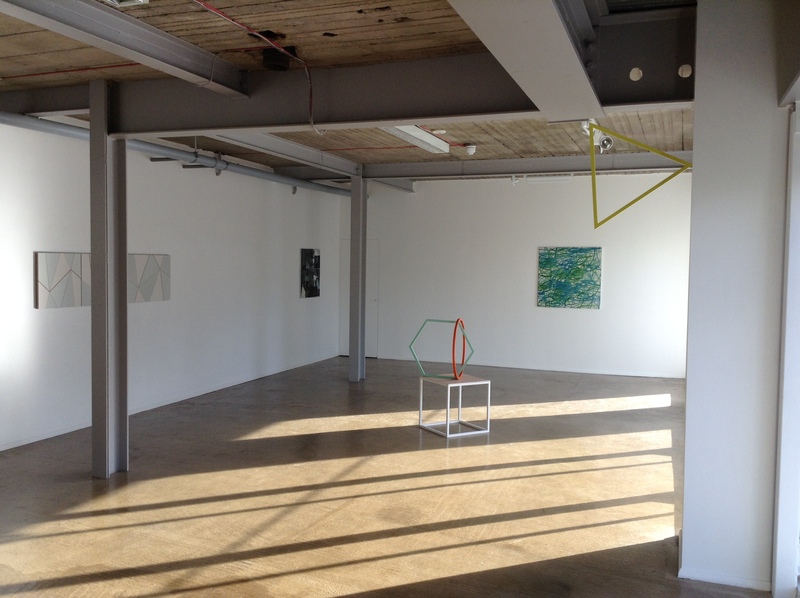 Pluspace, in the Meter Rooms, just on the edge of Coventry city centre, is host to a wonderful exhibition celebrating the continuing exploration of the possibilities inherent in abstract painting. 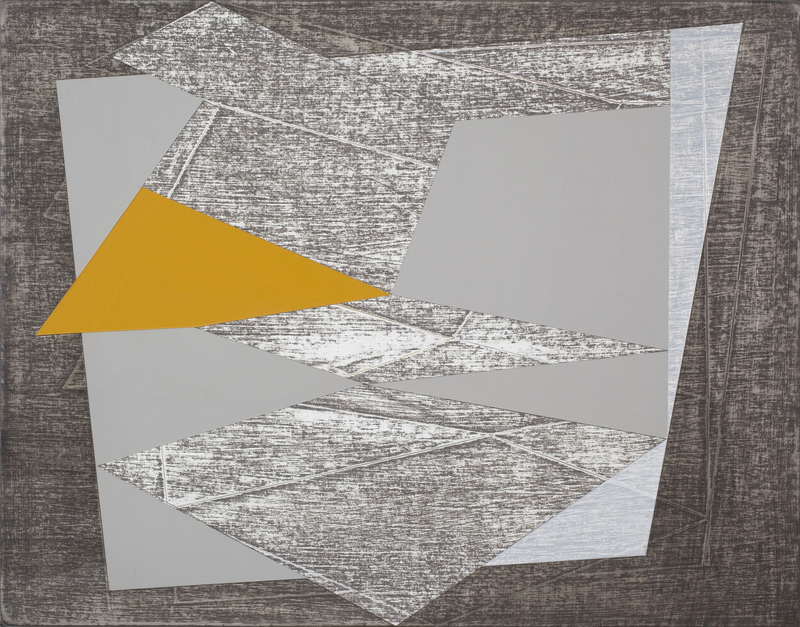 Without an Edge There is no Middle brings together a diverse set of contemporary abstract painters that “look beyond the comfort of the safe harbour of the middle, and push towards the unknown edges”. 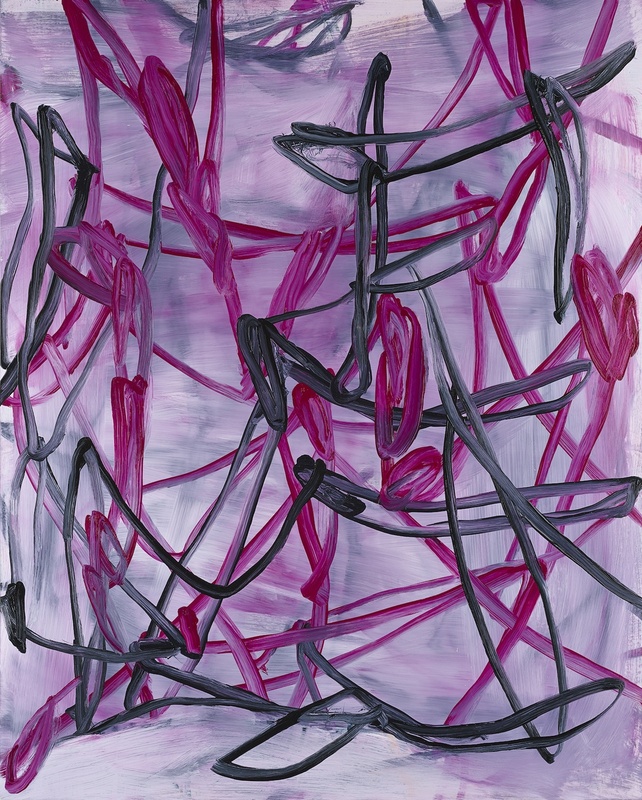 Curated by Matthew Macaulay, it captures, if just for a moment, that determined if sometimes gradual, pushing out towards the edge of what painting can be and do. No longer a “progression” as it might once have seemed, and inevitably including repetition or recommencement, there is also a faltering “progress” of sorts, a wending of different ways towards one end. 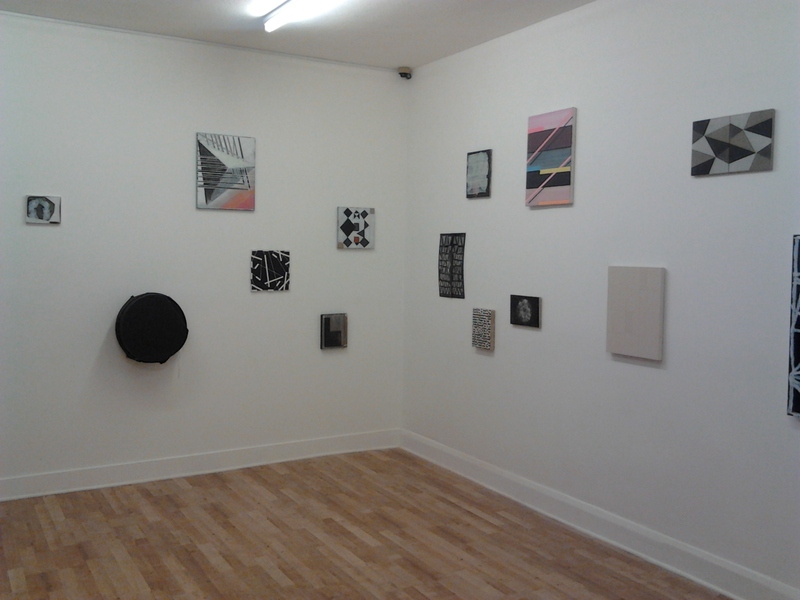 The artists exhibited are Katrina Blannin, Julian Brown, Gordon Dalton, Andrew Graves, Terry Greene, Mark Kennard, Hannah Knox, Mali Morris, Joanna Phelps, Dan Roach, David Ryan, Andrew Seto, and David Webb. 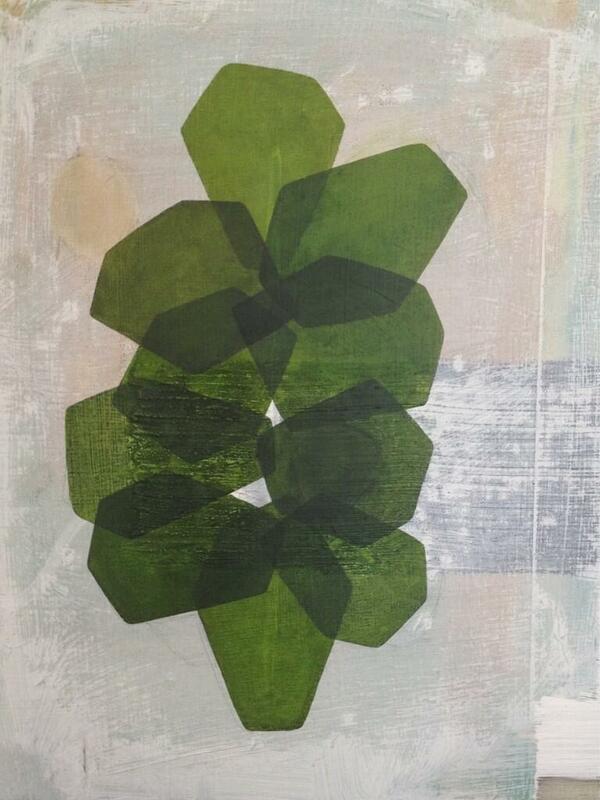 Again, I find that the paintings of Mali Morris quite literally take my breath away. I don’t know that I have ever seen colour so luminous, or space, self evidently the result of painterly gesture or manipulation, so mysterious. 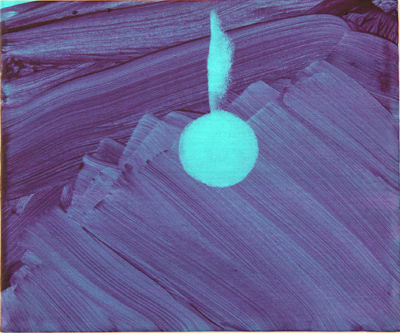 The central ‘figure’ in Blue Flame, a near perfectly formed blue circle supporting a further inchoate circle that resembles a flame, hovers above a gestural violet ground, itself resting upon a ground of the same colour as the blue flame, clearly seen at the top left edge but also shining through the darker gestural brushstrokes. However, this figure in the middle is made of the same stuff as the edge, created as it is by the removal of the upper layers of paint, an inverted keyhole through which a lower layer of blue ground is reveled, yet reading as if it were a positive shape above the ground. I think it is this play of figure and ground, both literal and optical, combined with the quality of colour/light, that I find so appealing in paintings by Morris, and I can hardly help saying “that’s beautiful” when I look at them. 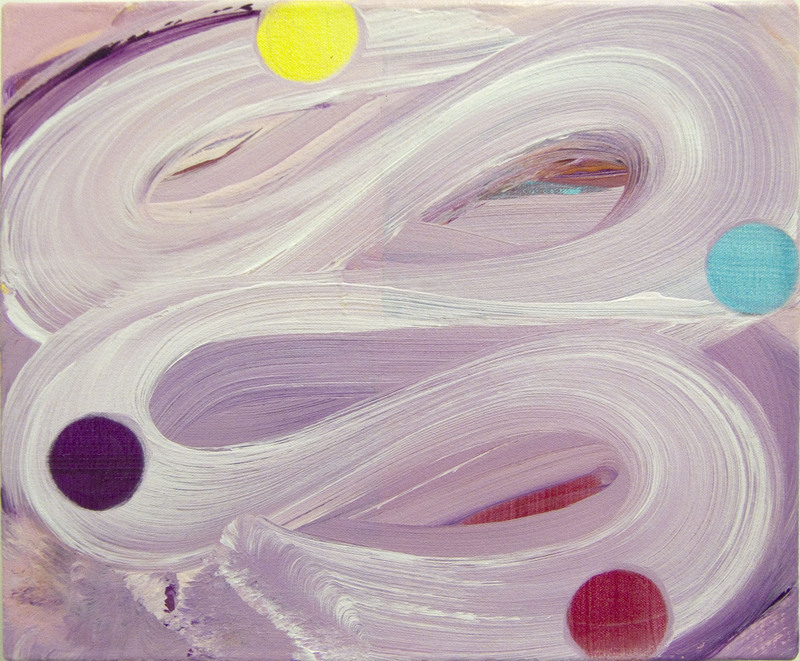 Almost, includes a gestural white helix over a multicolored ground, possible wet on wet, creating not just a sweeping rhythm but also depth through and beyond the gesture, with sentinel-like coloured discs that appear impossibly to be both tied to the surface by an imaginary or obscured grid and also free floating in space, almost airborne but held back also by the edges of the support. Yet, as with Blue Flame, those positive circular shapes hovering “above” are clearly excavations of lower layers of colour. I don’t think it is just my playing with the title of the exhibition that leads me to pay attention to the edges of many of the paintings here, sometimes as if the action gets pushed outwards, as in Andrew Graves audacious painting Tomorrow. 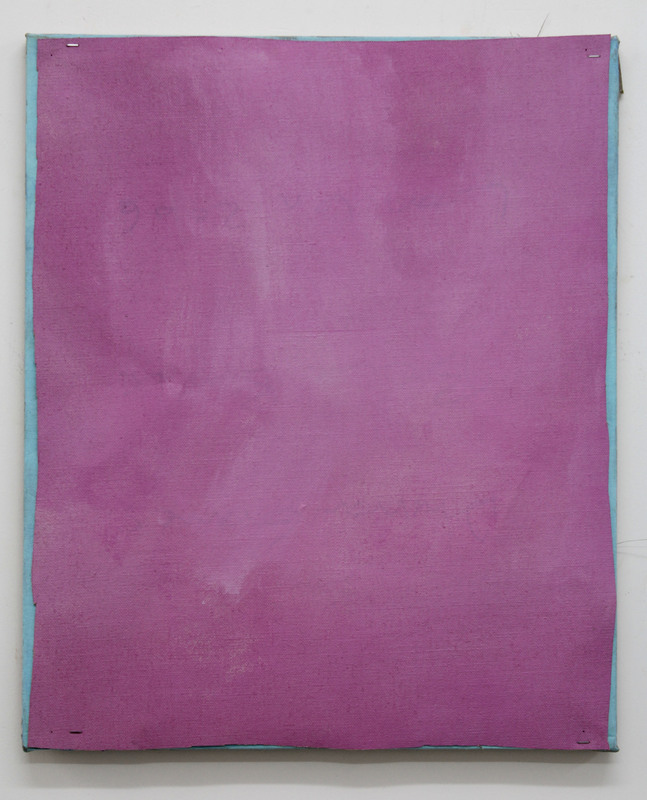 a stained canvas of magenta stapled over a blue canvas, covering it almost entirely, the colour contrast taking place right at the edge, creating tension between the framed image and the parameters of the object. I am tempted to liken it to colour field painting on a small scale, if that were possible. Mark Kennard‘s Untitled, is more or less a monochrome ground, again with the action taking place towards the edges as the bars of the stretcher seem to bleed through to the surface, creating a frame, within which barely perceptible events take place. In his Nine Lines on Black, narrow, differently coloured lines, all of similar length, interrupt a black ground, each line having at least one end touching an edge, and non of them crossing each other. The subtlest of interventions resulting in spatial shifts, clearly two dimensional yet also suggesting box-like objects on a floor. 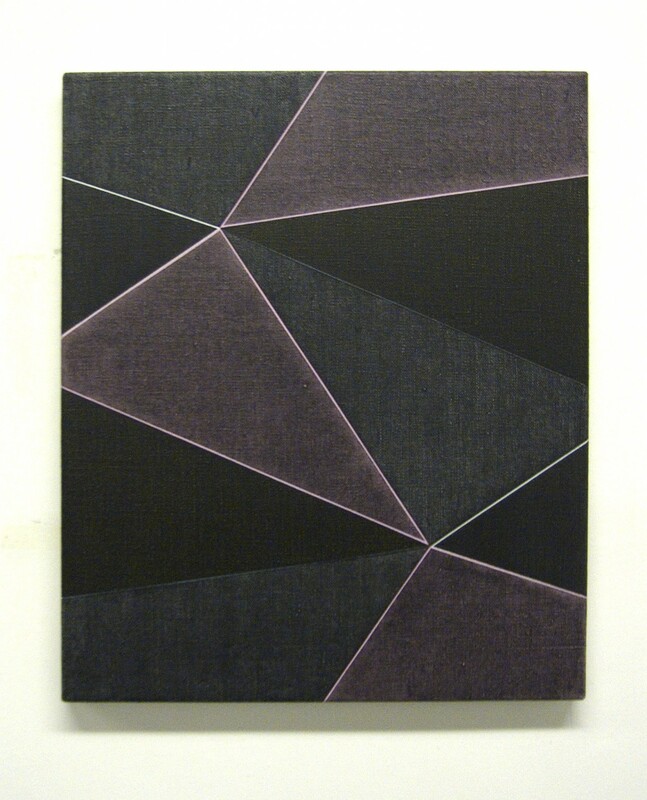 But it isn’t the edge I pay attention to in the Andrew Seto paintings. 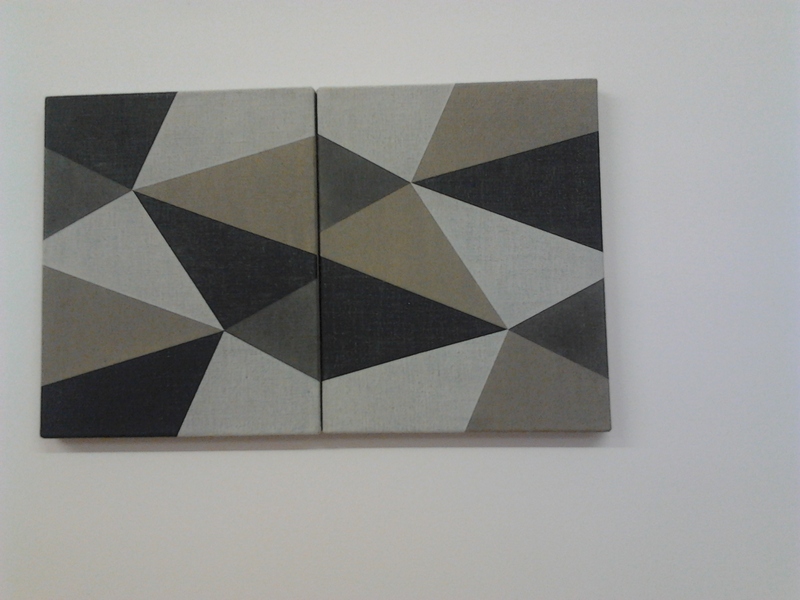 More pictorial, they seem to be paintings of something, as if structures formed of triangles situated in a sparse landscape or interior were actually constructed of sumptuous oil paint. 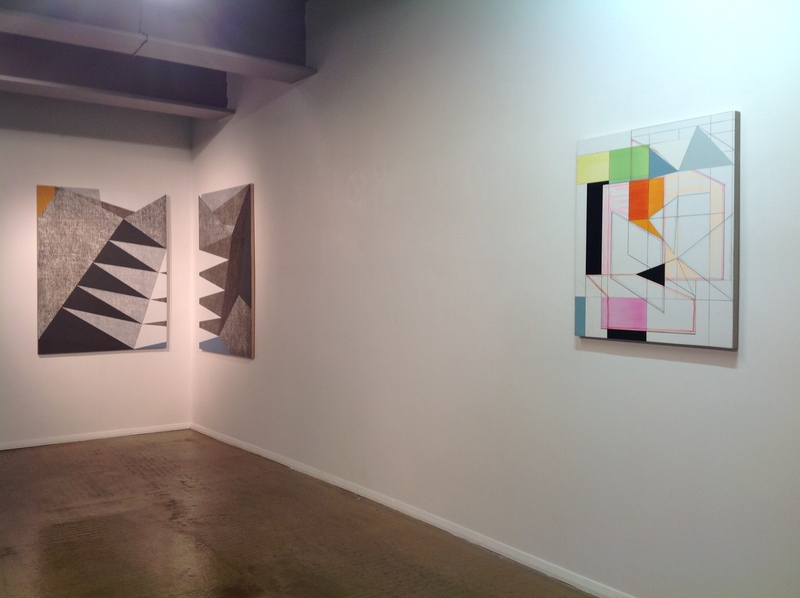 They have this sculptural look to them, even though in the two paintings here, Ahead and Pom Pom, there is no horizon line, (in contrast to Seto’s Device, currently on show at the Lion and Lamb Gallery), so situating them in a space becomes more difficult, and alternative interpretations might assert themselves. 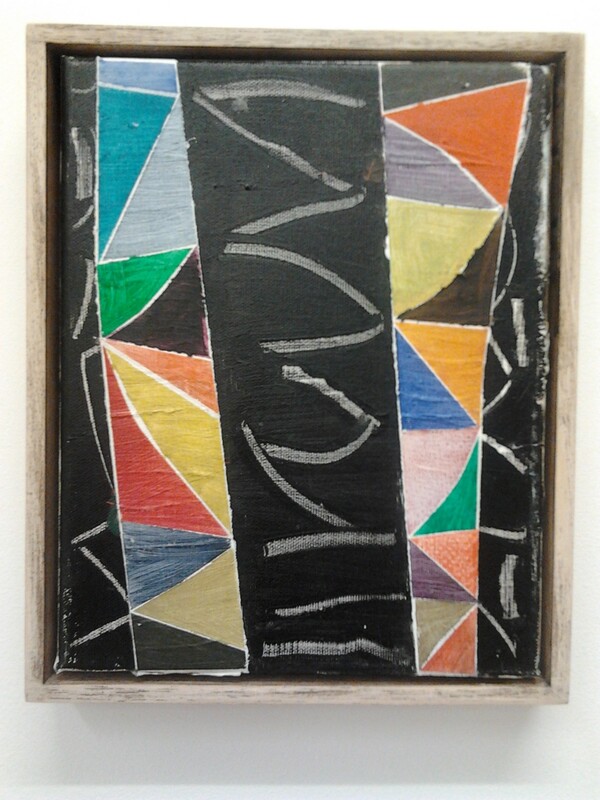 Ahead looks totemic, recalling African masks as painted by Picasso, whilst the thickness of the paint has something Auerbachian about it , but richer in colour and without the external referent. Around the central figure, the warm area that I am reading as ‘background’ pushes forward creating depth through the latticework structure only to lead the eye back to the surface again. Pom Pom, is a flatter image, without the impasto, in rich grey and blue, also exploiting triangular forms with much more of an alternation between figure and ground. Seto seems to have discovered a fascinating modular structure that is capable of multiple combination, extension and variation. 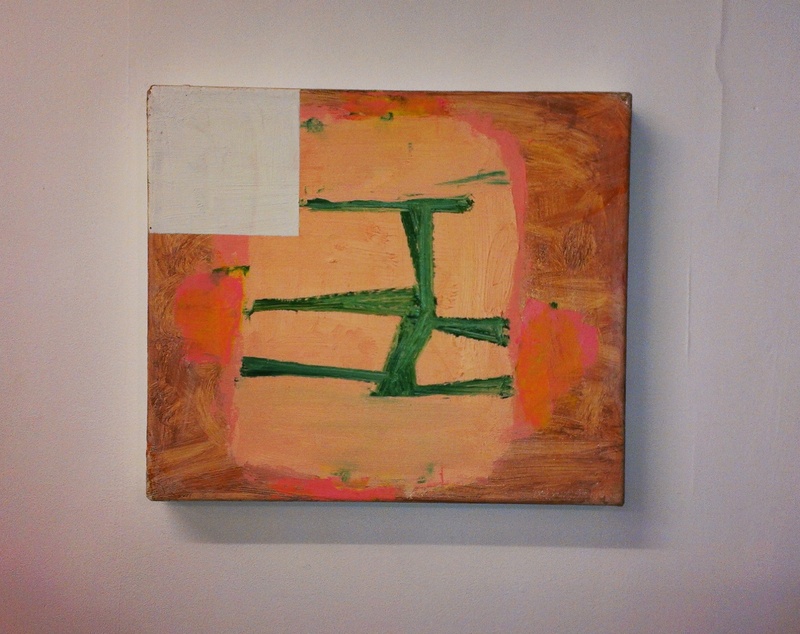 Terry Greene‘s They’re not scared of you, is an attractive painting with simple bar shapes of blue on ochre against a variegated green and blue ground, It’s simple yet has the appearance of having been hard to come by, there are signs of struggle. I reflect on Greene’s process, thinking that the first thing that goes down on the canvas is necessarily a “mistake”, the painting appearing to have progressed via a series of “corrections” not knowing what the end will look like until it arrives. The starting point is an act of faith, like Abraham “who went out without knowing where he was going” (Heb 11:8). It occurs to me that abstraction could be classified according to the amount of planning that takes place before work commences. Terry Greene would be at one end of the scale, with say, Katrina Blannin at the opposite end. 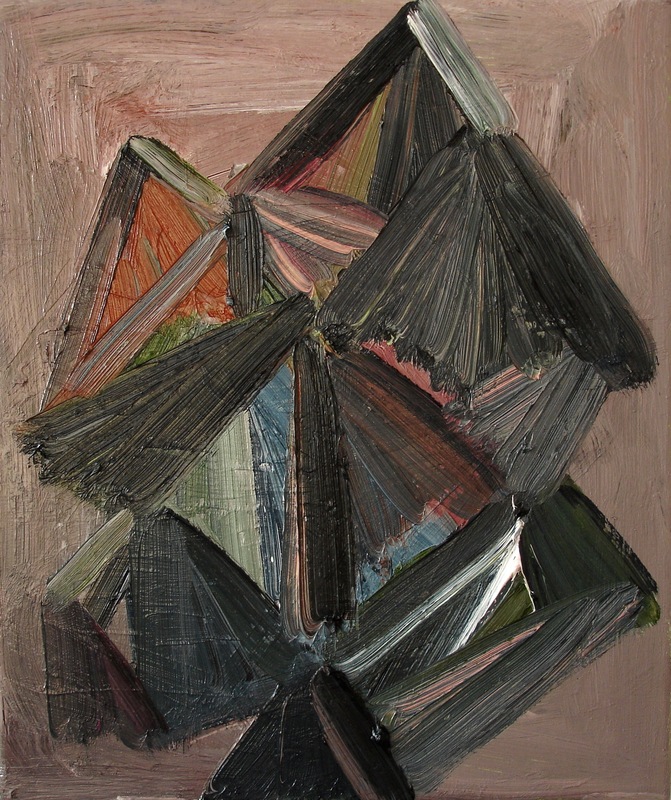 David Ryan‘s paintings might include improvised events within a planned structure, possibly comprising a systematic study. The two paintings here Set c and Set 5 (d), both read to me like paintings within a painting, different versions of abstraction in conversation with each other, both of them including a monochrome and a more gestural piece, signs almost, of differing approaches, held together within a frame, forming a kind of “gallery” where they jostle for attention, achieving a continuous push-pull effect. 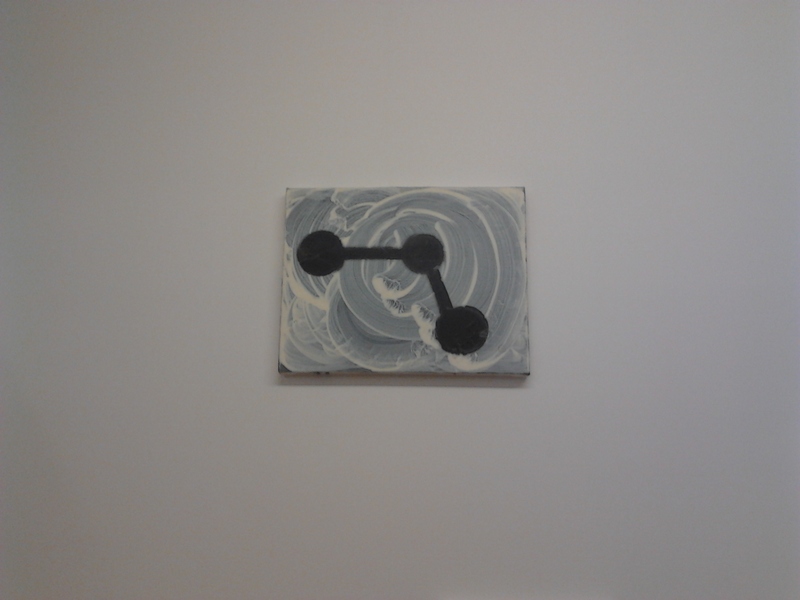 I am enjoying seeing two David Webb paintings, a very recent one Untitled (Windmill) close to the older, Smoking Room (Blue) the former is more abstract the latter more obviously on the edge of figuration. I love its humour and simplicity. 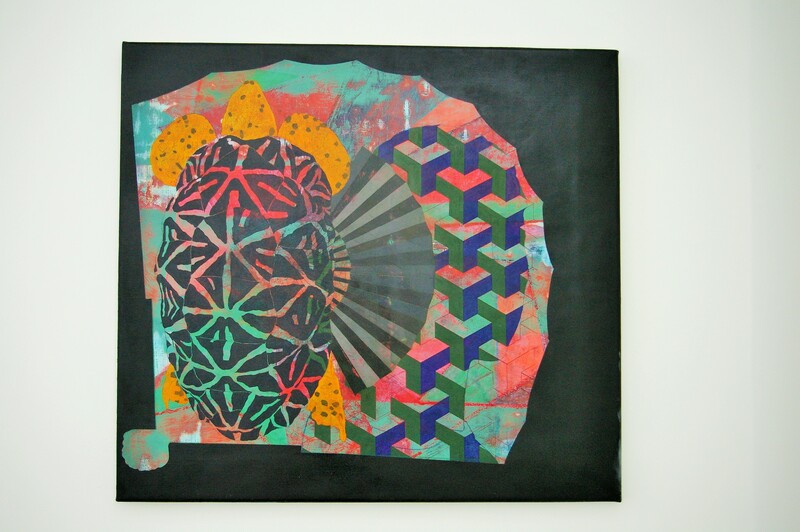 The Dan Roach paintings also nod towards figuration in that the beautiful hexagonal forms he employs could be cells of a honeycomb, yet they inhabit only this abstract space, combining in transparent overlapping layers to form an entirely abstract arrangement, virtually impossible to tell which layers are above and which below when I allow my attention to take in more than two cells. There is something entirely congruent about the scale of these paintings in relation to the cells: architecture in miniature, challenging, along with other artists here, the notion that abstraction must necessarily be big. 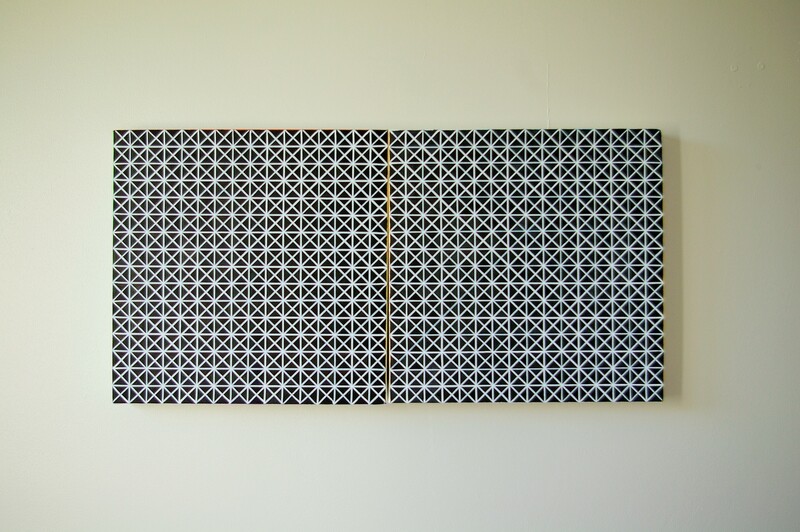 The hexagonal or hexad form also features strongly in Katrina Blannin‘s work but if Roach’s hexagons are organic in character Blannins are geometric, rather than allowing overlapping of forms, she explores the ‘natural’ propensity of geometric hexagons, and triangles to tessellate. Whatever the intention, the finished work is never entirely as envisaged. the power of surprise is important: its Gestalt, or ability to be more than the sum of its parts. 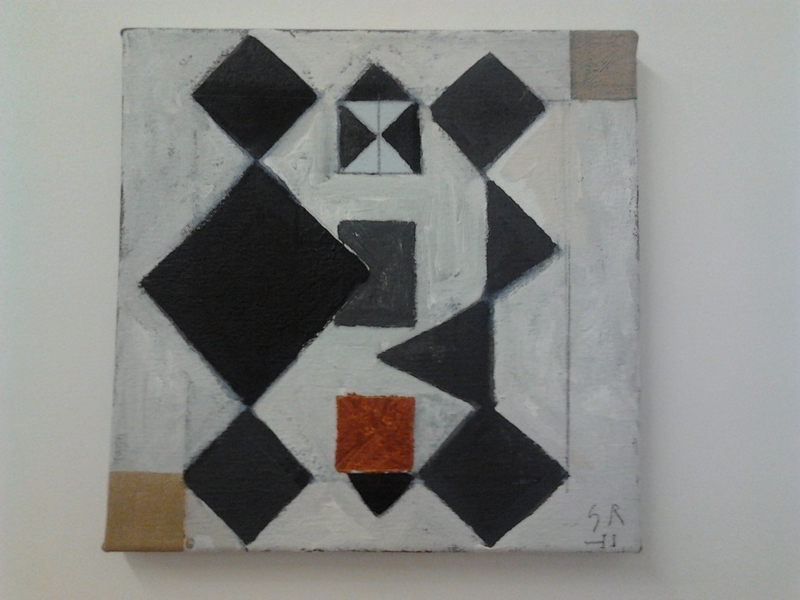 The 22 paintings in this exhibition all have an edginess about them that makes them appealing, and all worth spending some time with, all approaching the task of painting and of abstract painting in particular, in different and interesting ways. The exhibition title is based on two pieces of prose by the author and poet Toby Litt which can be read on the Pluspace website.